One of three games released based on the Sonic Boom cartoon series (unrelated to the 1983 Sega arcade game), Sonic Boom: Rise of Lyric quickly became infamous for its abundant glitches and general lack of playtesting, arguably rivaling Sonic '06 in sheer incompetence. Lots of cut dialogue. See talk page. There's many unused voices referencing a scrapped plane level, likely between the scene where Sonic jumps on and where it crashes. Tails: It's gonna get rough, hang on! Knuckles: Now there is a difference between flying and falling Tails! Amy: How about you let us know when you're turning? Tails: Watch out for enemy fire! Knuckles: You're firing at us. Amy: You're shooting at us! Knuckles: Targets at 12 o'clock! Amy: Aim for the targets right in-front of us! Tails: We need to take out that cargo hold! Knuckles: The only good things about more enemies, is I get to destroy more enemies! Amy: Look at the size of Lyric's ship! Sonic: The tower just took out a ship! Tails: We're starting to win! Knuckles: This is nuts! Oh no, now i'm hungry. Amy: I've never seen anything like this before! THIS IS NUTS! Sonic: Heroes are made, go, go! Tails: Stay focused, this is crazy! Knuckles: We got to take out the two big ships, that control everything. Amy: Aim for the biggest ship we see! Sonic: Try and destroy the cloaking systems on the command ship! Tails: How do you know it's the command ship? Tails: We must take out the engine of the main ship! Knuckles: Go after the big one! Knuckles: We need to destroy the communications tower! Amy: Can't have anymore ships, Lyric! Sonic: I don't know which one i'm loving more right now, the ancients and their turrets. Tails: Wow look at those turrets go! Knuckles: Yes! Hard to fly without an engine! Tails: It destroyed! They are flying blind! Knuckles: I'm getting a little, *sick sounds*, queasy. Amy: The bigger they are, the greater they fall! Sonic: I hope they have insurance. Tails: Take out those fighters while they're on the launch pad! Knuckles: I'm not hitting anything! Amy: I'm destroying everything I see! I could get used to this! Sonic: He's got to be taking the Crystal somewhere! Knuckles: All right. This time we are doing some damage! Amy: Here we go, get ready, this is the one that counts for the win! Sonic: Lyric has the Crystals, stay with him! Tails: Gonna try catch up to Lyric! Knuckles: Where do you think he's headed? Knuckles: Flew right into that one. Bizarrely, there's some lines with the characters swearing. Knuckles: You guys must of really pissed them off! For some reason or another, the developers forgot to remove some buttons that activate certain missions and unlock Crystals. It probably helped them with the limited testing they did with this game. There are a few out-of-bounds buttons around Bygone Island, where Perci stands. Probably activates the "Perci" mission and the Crystal nearby. In Cliff's Excavation Site, there is a button right underneath Chef Woody's tent. When you press it, it activates the "Chef" mission, and you can collect the reward. Around the cave area in Crater Lake is an invisible Hammer rail. You can swing off of it, and it behaves like normal. Find the model and rip it. Also, upload a better photo of this. There is an unused ball, loaded in the main area of Slowpoke Isle, with a texture of the words "Replace Me" on it. It doesn't seem to do anything. 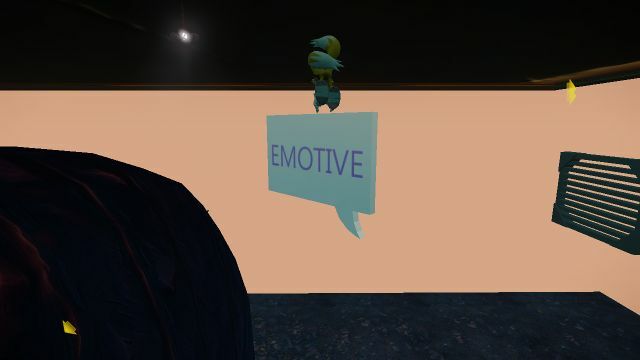 Out of bounds in The Pit, just behind where you meet up with Tails and Amy, is a slightly 3D model of a text bubble which has the word "EMOTIVE" embedded on it. Like with the "Replace Me" ball, this does absolutely nothing. 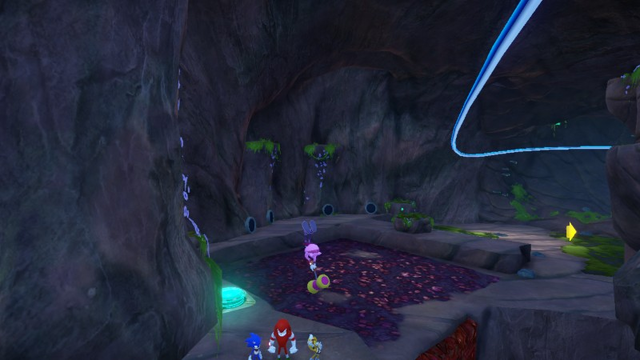 Present on the disc is an early version of a cutscene, showing Sonic using one of the Crystal shards. Full descriptions for every character in the game exist in the game's text. It was meant to be accessed through Q-N-C's Database, but none of it is accessible in the final game. They would've been organized into four groups: Heroes, Friends, Bosses, and Enemies. Hi, this is my Database where I store all sorts of cool info on all the characters in Sonic Boom. Come back here to check out new entries as you explore the world! Sonic He's blue, and he's fast, and spiky. I like fast and spiky! Although I don't like being blue; red is more exciting color, and Sonic's shoes are red, so I guess that's cool! Sometimes he's a little mean to me, but I think it's because he's so impatient. Nobody is perfect, but I wish I could be a hero like Sonic one day (maybe when I grow up). Oh wait, I'm a robot, so I'm already old. Shucks! Tails Tails is short and smart and into gadgets and technology. Kind of like me! He's always handy at repairing things and he's got plenty of Buddy Bots to play with. I wish we could hang out more often and become friends, since we have so much in common, but he's always going off on wild adventures with Sonic. I think they've been best buddies for, like, ever, so I guess I'm not that high on his list of priorities. Knuckles Knuckles is really good and climbing and digging into the ground with his big strong arms, but he's always disagreeing with Sonic. I think they used to be rivals or something. I think they kind of want to be buddies, but they're just too stubborn to admit it. Isn't that silly? Friends should just be honest and play nice! Everything would be so much better for everyone. A robot buddy would never act like that! Amy Amy is an acrobat who does flips and jumps and all sorts of gymnastics on the balance beam. I really admire her! She packs a whallop with her hammer, and out of all my new best friends, she's the friendliest. She's always trying to get the rest of the gang to co-operate, but Sonic and Knuckles are usually too busy arguing about this or that to listen to her. It's too bad because I think she is super-duper nice and cool. Cliff Cliff is the head of the Expedition to find the ancient tomb where Lyric was imprisoned. It was SO boring to be sealed underground for all those years with nothing to do, but Cliff is really into all that old stuff with the ancients and technology. I don't think he knew what he was getting into when he started telling his workers to digging around. Oops, live and learn! Q-N-C Hey, that's me! Pretty cool looking for an ancient robot, huh? Lyric was my creator, but then there was little weird accident where my wires got crossed, and I started to think and act for myself! I realized that I did some bad things, but now I want to be a good robot, help people, and make a best friend. Tucker Tucker wandered into the Expedition Site a few weeks ago. I heard some of the workers say that he came from a far away land called Slowpoke Isle and that he was once a great scientist. He stays away from the camp near the entrance to that old, Abandoned Facility. He's always looking around there for something and seems kind of sad and lonely. I wonder if he'd like to hang out sometime and play some games! That always helps when I get the blues! M.A.I.A. M.A.I.A. stands for Manufacturing Artificial Intelligence Administrator. What a mouthful. I bet she wishes she had a cool name like Q-N-C! She's the boss program that runs Lyric's Ancient Weapon Facility. Salty Captain Salty is a sailor who hangs out by the waterfall on the west side of the Excavation Site. He has this cool boat called the Riptide. Did I mention that it is cool? It is SO cool! It can sail through the roughest rapids, plus, it has all sorts of cool gizmos and zappers on it. LOVE gizmos and zappers! But sometimes, it doesn't work, so Salty gets all grumpy when he has to fix it up. I think he's just visiting the Excavation Site and has family in a distant town somewhere. Must be nice to have a real family! Chef Woody Chef Woody prepares the food for all the workers at the Excavation Site. He is a great chef but he's super-grumpy! You would think that eating all that delicious food would make him happy, but it doesn't do a bit of good. Doc Ginger Doc Ginger helps keep the workers of the Excavation Site healthy and happy. But she carries around a big needle and that makes some of the workers run away. I wonder why? Whenever I don't feel good, a little repair work never hurts. People are very strange creatures! Mayor Fink Mayor Fink heads the village of Bygone Island. He seems really friendly and really likes to talk to lots of people. I think he enjoys being popular! It's too bad Bygone Island is so far away - maybe we could be friends too! Sticks Sticks lives on the outskirts of Bygone Island. I've heard that she's kinda weird and strange. She loves to collect shiny things then go bury them in the ground. I hope she doesn't mistake me for some old piece of junk and try to bury me - that would be terrible! Pepper Pepper is Captain Salty's brother, and he lives in Crater Lake, overlooking Bygone Island. Pepper also has a cool boat like the Riptide, but I think he got trapped up there by all the Swarmer Hives. He says he's too scared to leave and re-unite with his brother, Salty, but I think he can't fit into his boat anymore! Hokey Hokey is a jellyfish that uses an ancient robotic carriage to get around above the water. She lives with her husband, Pokey, around Crater Lake. They used to live closer to Bygone Island but they moved to the warmer waters of the volcanic crater. Much nicer for the tentacles, I guess. Pokey Pokey lives with his wife, Hokey, in the warm waters of Crater Lake. They are always bickering and arguing. I guess after all those years together you start to get irritated over the silliest little things. Or maybe they are just bored. I wonder if they still love each other or not - good thing robots are not programmed that way! Perci Perci lives on Bygone Island. She cares very much about her home and the people of the village, but they don't seem to take her worries about Lyric seriously. They should! I've seen him do some bad things! I like that she's not afraid to take action no matter what people around her think. Sometimes you gotta be brave and be an individual to stand up for what you think is right! Hayward Hayward is a farmer in Bygone Island. He wants to be a hero just like Sonic and friends and join the fight against Lyric, but he has to take care of the crops first. Chores must be such a drag when you've got big dreams! Fastidious Fastidious hangs out on the shores of Conundrum Cove, waiting for someone who can beat his challenge. I don't think he's really all that excited about it, but nobody is pushing him towards something better, so he just sticks there, like a wet blanket on the ground. Maybe he would enjoy the life of a heroic sidekick one day? Shadow Shadow could care less about the ancient ones' crystals. As long as it torments our hero friends, he'll gladly play a game of keep-away. Driller Worm There aren't enough breath mints in the world to get this guy a date. It must be a lonely life digging up and chewing on dirt looking for those ancient crystals. Metal Sonic I can never understand a word he says, but I don't think wants to swap cupcake recipes. Maybe after the dust settles we could road trip to the tech expo and have a good laugh at our creators. Eggman Eggman is Sonic's greatest enemy, but I can't imagine why! His new school robot engineering techniques are rudimentary at best. Kid stuff! Lyric As my creator, Lyric was once my idol. He was dominating and angry with a dollup of charm. But the thought of all those bad deeds makes my hydraulics boil. Swordsman Trooper Swordsman Troopers Best evade these guys when they start swinging. Parasite Snake Parasite Snakes Get these suckers before they waken dormant enemies. Beam Drone Beam Drones They make great targets for air attacks! Gunslinger Trooper Gunslinger Troopers Bob and weave is your best tactic against these rangers. Commando Husk Commando Husks Might I suggest destroying these before they wake up? Charger Chargers Be ready when these tough guys start head-banging. Roller Recoiler Roller Recoilers Just stay airborn and everything will be alright. Right? Blaster Trooper Blaster Troopers Sometimes you gotta fight fire with a buddy. Crusher Brute Crusher Brutes Well, at least they're slower than grandma's dial-up. Driller Snake Driller Snakes If only there was a way to get underneath these pests. Swordsman Guard Swordsman Guards If you can't break 'em, yank 'em. Gunslinger Guard Gunslinger Guards No point in attacking until you destroy that shield. Blaster Guard Blaster Guards Enerbeam plus shield equals fair fight. Furnace Brute Furnace Brutes Air attacks are no good here. You'll just get burned. Roller Bouncer Roller Bouncers Don't wait around for these guys to ball up! Charger Dart Charger Darts Tails might be able to handle these guys. Fridge Brute Fridge Brutes Too heavy to throw, but if you can stun him first..
Ring Thief Ring Thieves Bot stole my rings! Better get my hammer. Gatling Elite Gatling Elites Boy is this guy shockingly fast. Roller Shocker Roller Shockers Hope you've got friends. You're gonna need em against this rust bucket. Bomber Elite Bomber Elites You're gonna need a bigger boat. And a new pair of pants. Swarmer Swarmers Harmless fodder, but I hear they carry weapons in their packs. The notorious Knuckles infinite jump glitch no longer works. The cutscene where Lyric takes control of Metal Sonic has different, more cinematic lighting. The laser Metal Sonic fires at Eggman in this scene was changed from red to yellow. 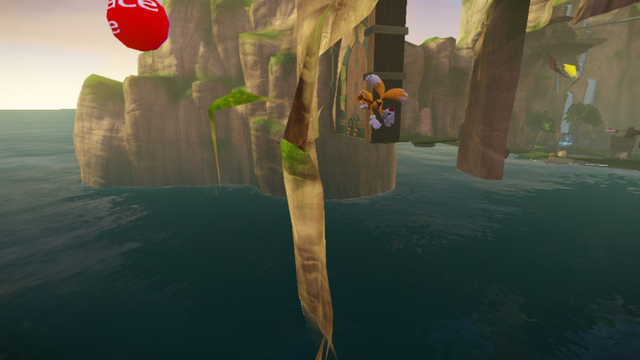 Collision for six levels was altered to prevent characters from going out-of-bounds: Cliff's Excavation Site, Bygone Island, Crater Lake, Tomb of Lyric, Lyric's Weapons Factory (past), and Ocean Purification Plant. The frame rate is more stable in some speed sections. The controller diagrams in the pause menu have slightly different coloring, such as a blue ring around the Home button. This page was last modified on 22 February 2019, at 21:25.